Rendered image of Inspire Integrated Resort. 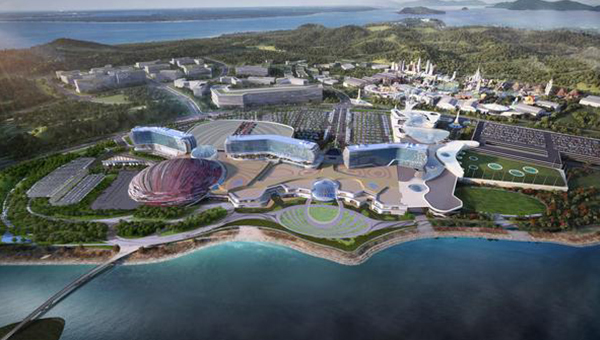 Ground will be broken next year to kick off a $2.5 billion project to create a mega-scale integrated resort city around Korea’s main gateway of Incheon International Airport. The project is aimed to turn Incheon’s Yeongjongdo Island where the main airport of South Korea is located into a MICE (meeting, incentives, convention, and exhibition) location in the likes of Las Vegas. Korea’s largest resort complex Paradise City and Caesars Korea will also join the complex where foreigners-only casinos will open. The Incheon International Airport Corporation on Thursday signed a business cooperation agreement with Inspire Integrated Resort and Paramount Pictures. Inspire Integrated Resort is a special purpose company of U.S.-based casino resort operator Mohegan Gaming and Entertainment (MGE). MGE leads the complex that would span over the airport’s northern-end IBC-III zone. Paramount Pictures known for ‘Mission Impossible’ movies will invest 1.2 trillion won ($1 billion) in total into a theme park to be built within the complex. The project will create the country’s largest entertainment complex featuring a luxury hotel complex with five-star guest rooms, a multipurpose performance hall with 15,000 seats, a Paramount Studios-themed indoor-outdoor amusement park, and a convention center, and a large-sized casino. Inspire will inject 2.8 trillion won into the resort, with the goal of opening the resort in June of 2022. The Incheon International Airport Corporation expects the project will create over 10,000 jobs and attract 3 million tourists every year.